If you’re planning to go on holiday in few week’s time when the kids break up from school, why not treat yourself to some stylish travel essentials before you go. Penelope Hope is a British homeware and accessory brand where you can find luxury cushions, designer fabric, lampshades and bespoke furniture pieces adorned with vibrant and playful prints. Founded in 2015 by artist & designer Nadia Newton for style-savvy colour lovers, like us!, their unique fabrics inject instant colour and energy to ensure they’ll never fade into the background! Now their collections also include makeup bags, washbags and tech cases to ensure that you’re well prepared for your summer break. These covetable tech cases, in an array of our bold & bright prints, will stylishly protect your hardware and are just begging to be on show! You can choose from cases to fit your laptop, tablet, iPad or Kindle. They are made with a thick cotton outer fabric, water resistant lining and padded neoprene core. Each case is finished with a sturdy zip and brass ring pull zipper, making them super practical. The cotton tasselled makeup bags are the perfect size for stylishly storing your favourite makeup or as a handy small travel wash bag for the beach, mini-breaks or overnighters. Designed with all the extra details, these awesome makeup bags feature colourful contrasting zips, silk tassels and water resistant linings. 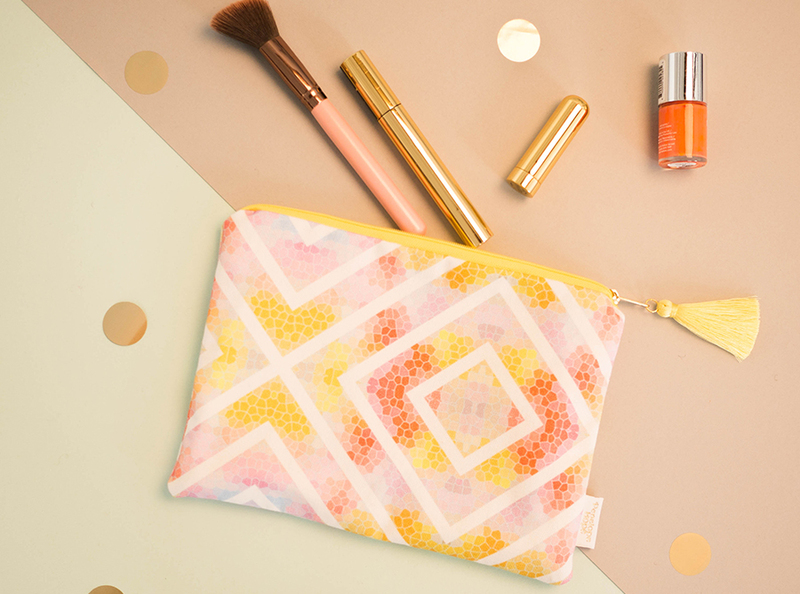 This is not only a practical makeup bag but super stylish too! Here is our favourite trio. Which do you like? Don’t forget for limited time only, we’re offering the Matthew Williamson issue for FREE. Get your copy here.